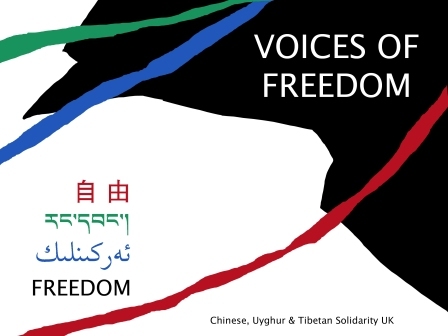 The following is the introductary speech to Voices of Freedom (a concert held in central London on 12 December 2012 to highlight cultural resistance in China and to mark Human Rights Da), given by Jessica Trevis, who works at Amnesty International. Note: the views and opinions are Jessica’s and do not necessarily represent those of Amnesty International. Human rights violations in China are systematic. They cross over boundaries of religion, culture, freedom of speech, or of association. They infiltrate everyday moments and actions. It does not matter whether you are ethnically Han, Uyghur, Tibetan, Falun Gong, a lawyer, a mother or a student, all groups within China are vulnerable to the violation of their most basic human rights. The recent attention in main stream media has voiced to the wider world the severe injustice suffered by both Tibetans and Uyghurs as ethnic minorities in China. The radically intensified wave of self-immolations and continued lack of response from the Chinese government reminds us all for the need for global action on behalf of Tibetans and other groups targeted by authorities. Even when visiting Tibet in 2010 I was shocked by the transparency of the repression of cultural norms and the openness of the Tibetan people in voicing their opinions about the persecution they were suffering. Arriving at the beginning of Saga Dawa [an annual Buddhist festival], my first impressions were one of significant military presence. Armed military personnel were poised at each street corner and there was severe restriction of movement. Checkpoints were not only assembled for vehicles travelling outside of the city but within Lhasa itself, with monks on their way to monasteries being frequently intercepted by desks of registration points. The monasteries themselves were also inhabited by clear signs of surveillance and obstructions demonstrated by the presence of ’Re-education Centres’. These things alone were enough to allow me to witness the underlying grievances of the Tibetan people. But beyond these everyday aspects of life in Tibet, Tibetan people are frequently subjected to wide scale raids, mass detainments and the excessive use of force by Chinese authorities during area crackdowns. These crackdowns are prompted by anything from the flow of information, the possession of a picture of the Dalai Lama or, as we have seen most recently, wide scale peaceful protests and civil unrest. During times such as these, it is vital that we remember the inequality of media coverage and therefore endeavour to not allow it to silence the continued violations in China that are less reported. For example last week in Henan province, 50 Uyghur individuals were hospitalised after clashing with police in a rally of 1,000 peaceful protesters. In a similar sign of indifference, the Chinese government refused to even acknowledge casualties in this incident. The protest, similar to the riots that spread through Urumqi in 2009, was caused by the Uyghur community’s reaction to cultural discrimination after a Uyghur woman was forcibly de-veiled. These tensions and frustrations between ethnic lines are themselves a product of the Chinese authority’s sponsorship of derogatory and discriminatory policies towards Uyghur and Tibetan ethnic identity. Inside East Turkestan Uyghurs suffer the same cultural and religious persecution as the Tibetans do. As monasteries are monitored, controlled and emptied, many mosques are completely eradicated or banned from use, particularly during Islamic religious festivals. The Uyghur landscape, so important to the identity of its people, has been rebuilt in a style fitting to a Han Chinese population and ancient streets renamed in a language alien to the origins of the Uyghur people. While Tibetans fighting for the protection of their cultural rights are deemed separatists of the Dalai Clique, Uyghur activists are promoted as a network of radical Islamists that strategically fits an international idea of terrorism. In the current context of human rights in China, voicing the desire to speak in your mother tongue can be a crime worth punishable by detainment, a prison sentence or even torture. As a Uyghur or Tibetan you are at a disadvantage to gain good employment, to have an education above that of primary level, travel outside China, practice your religion or speak your own language freely. Sometimes it is difficult to see how this extreme suppression of basic rights transfers to an individual life, so I would like to share with you a case that Amnesty International is currently campaigning on. Abdukiram Abduveli has now been imprisoned for 22 years. Ethnically Uyghur and a religious leader, he travelled around East Turkestan speaking on the need for religious freedom and the economic discrimination against his people. Subsequently in 1993 he was charged with “inciting counter revolutionary propaganda”. Detained for seven months before being charged, the criminal verdict linked him with an organisation called the Islamic Reformist Party, where they said Abdukiram was scheduled to hold a meeting with other members. However, he was arrested before this meeting could even take place. Despite the lack of evidence in court he was denied access to a lawyer or to his family. Originally sentenced to 12 years imprisonment and 4 years suspension of political rights Abdukiram Abduveli was due to be released in 2002. However his imprisonment has been extended four times. In his court verdict it states the reason for these extensions: “The witness statements by prisoners confirm that when the offender Abdukirim Abduveli was serving his prison sentence he consistently disobeyed the prison administration regulations, he refused to accept prison education, he many times engaged in praying, announcing a hunger strike, swearing and hitting the supervising inmates, and it is for these reasons that the offender’s reform points were deducted”. As a punishment for these ‘crimes’ Abdukiram is regularly held in solitary confinement in a small dark cell with no light for around 15 days at a time, he is also beaten as a “precautionary measure”. In 2011 his mother visited him and found him suffering from malnutrition and unable to stand. Later that year in November his mother travelled to visit him but was denied access. Instead guards allowed her to watch a video tape of him where upon she was informed that he had developed bone cancer. Although he is scheduled to be released in the summer of 2014, it is unlikely that this will happen without international intervention. But human rights issues in China do not just extend to those who are a minority. They are a problem of the majority. Individuals such as Liu Xiaobo, Gao Zhisheng and Chen Guangcheng have demonstrated the Chinese government’s desire to control and constrain the voices of those who have stood up to defend freedom of expression. Even with international support many have paid dearly for their bravery. Families of human rights defenders are frequently harassed, detained, coerced or even tortured by authorities in retaliation for speaking out. Chen Guangcheng, now safely studying law in New York, has felt such retaliation in the form of his nephew Chen Kegui, who two weeks ago was charged with inflicting intentional injury after his family’s home was ransacked and his parents beaten by plain clothed police. His family was informed of the trial only three hours before it took place and he was denied a lawyer of his choice. Chen Kegui was trialled by the same court that held an equally unfair trial in 2006 for Chen Guangcheng. In a recent meeting, Chinese lawyers expressed the extreme levels of intimidation that Chinese authorities exercise in order to pressure them to cease working on particular cases. Many spoke of being personally detained and tortured. The weak rule of law in China and abuse of local officials has not only allowed the practice of torture to become commonplace but also for it to flourish from the lack of accountability for its perpetrators. It is an acute challenge to encouraging the development of freedom of speech and expression in Chinese civil society. With the 18th Party Congress marking a transition for China, I feel it is not within the new leadership, who has already demonstrated the continuation of political conservatism, which we should rely on for change. Instead we should look to promote solidarity within Chinese civil society so that change can be brought about both on the ground and internationally. Last month saw a surge of online reactions concerning the self-immolations in Tibet on Weibo. The feelings expressed were not ones of anger or political motivations but ones of empathy and concern. They also remained uncensored for Chinese civil society to see. It is not just online that we are seeing such developments, the Falun Gong community and those who have experienced forced evictions have demonstrated the power of petitioning to local authorities. Petitions of over 1,000 signatures have mobilised action from not just Falun Gong but from neighbouring non-believers, allowing individuals to see beyond the authorities condemnation of Falun Gong members as a cult-like group, and recognise the need for unity in demanding a just rule of law. Solidarity events such as Voices of Freedom are crucial to achieving these goals. A key issue when campaigning for change in China is the creation of a collective network of activism, one that crosses borders of ethnicity, of belief or of political association. To give a voice to the human rights situation in China, we must first give a voice to all individuals that it affects. Voices of Freedom highlighted cultural resistance in China and marked Human Rights Day 2012. It was presented by the UK-based coalition Chinese, Uyghur & Tibetan Solidarity UK and featured imprisoned voices and banned works from Tibet, East Turkestan and China. Chinese, Uyghur & Tibetan Solidarity UK is a coalition of organisations and activists that opposes the tyrannical rule of the Chinese Communist Party and works to promote human rights, freedom and democracy for all the oppressed people and nations under the Chinese Communist Party. The coalition includes the following organisations: Chinese Solidarity Campaign, Federation for Democratic China, Friends of Tiananmen Mothers, Tibetan Community in Britain, Tibet Society, Tibetan Youth UK, Students for a Free Tibet UK, Uighur Association and Uighur Community UK. This entry was posted in Uncategorized and tagged China, cultural resistance, East Turkestan, freedom of expression, human rights, Lhasa, Tibet, Tibetan, Urumqi, Uyghur, Voices of Freedom. Bookmark the permalink.